While taking one of our daily strolls through the vineyard to check on progress and attend to any issues, I noticed our dog Mia was missing. 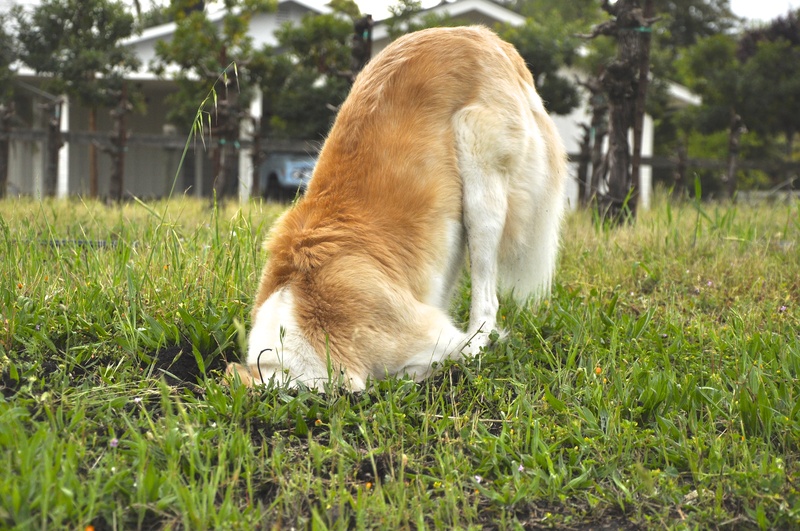 Nope – there she was, with her head down a hole in the vineyard. This is not an uncommon site, especially in the springtime. The little moles, voles, and critters who dig underground have babies this time of year and Mia can hear them and/or smell them and/or feel them in their subterranean tunnel homes. 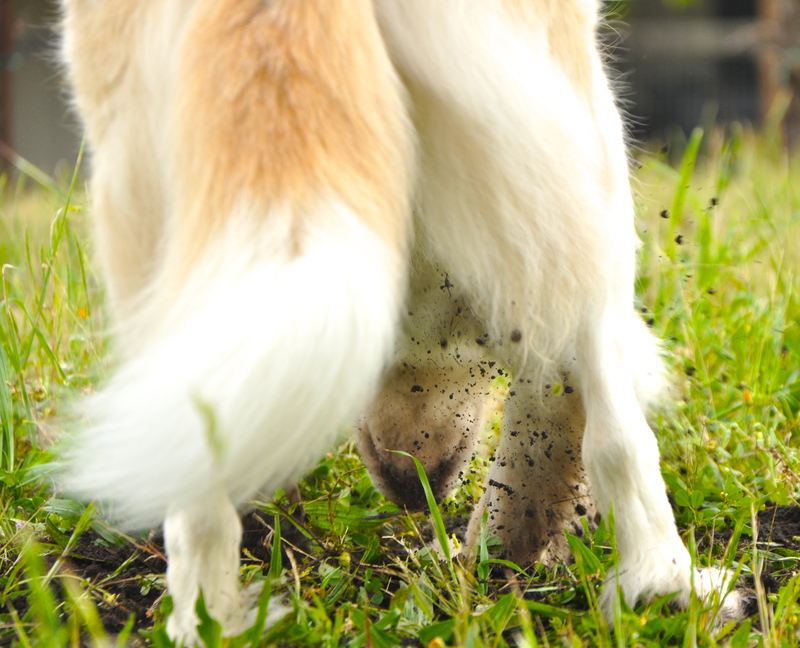 I hate to say this, but when our girl was younger, she loved to dig up the little varmint babies and toss them around. They were pink, blind and hairless. It can be so awful witnessing the wildness in your beloved house pet. 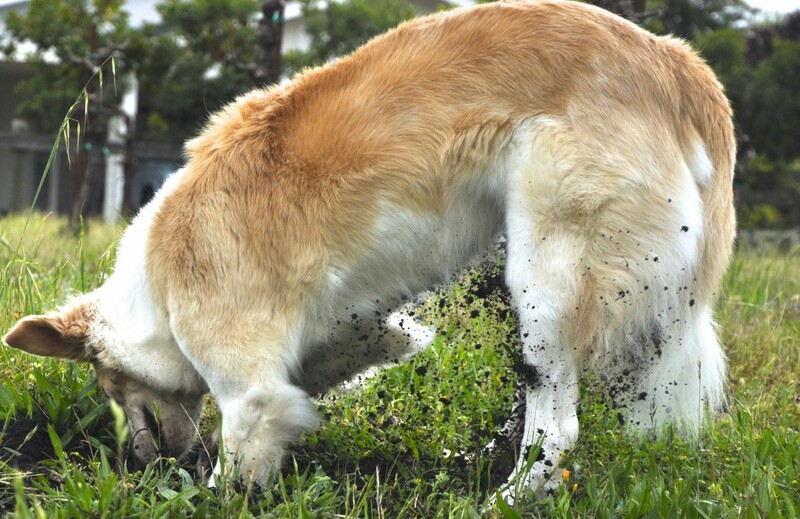 Now she still digs, but doesn’t dig deep enough or fast enough to catch anything anymore, thank goodness, but she still loves the chase. 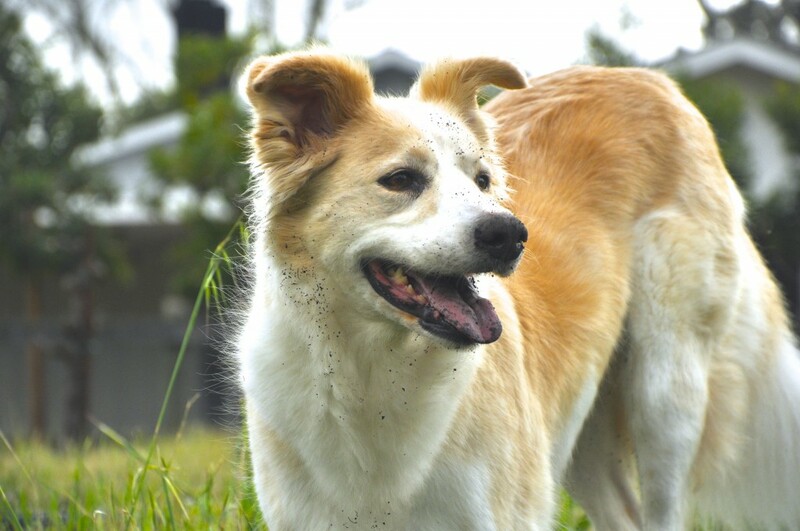 We adopted Mia from the Marin Humane Center in August ’05, and we think she’s probably a border collie mix. She’s much smarter than we are, and she’s as soft as a chinchilla and as gentle as a lamb. We got really, really lucky, and I also took her to many training classes, which she just loved. I love this dog with all my heart and obviously get a kick over pretty much anything she does. Me and Mia moments away from her adoption from Marin Humane Society. My parents made the mistake of getting me a puppy when I was a baby, which for the sake of its safety was quickly given away. 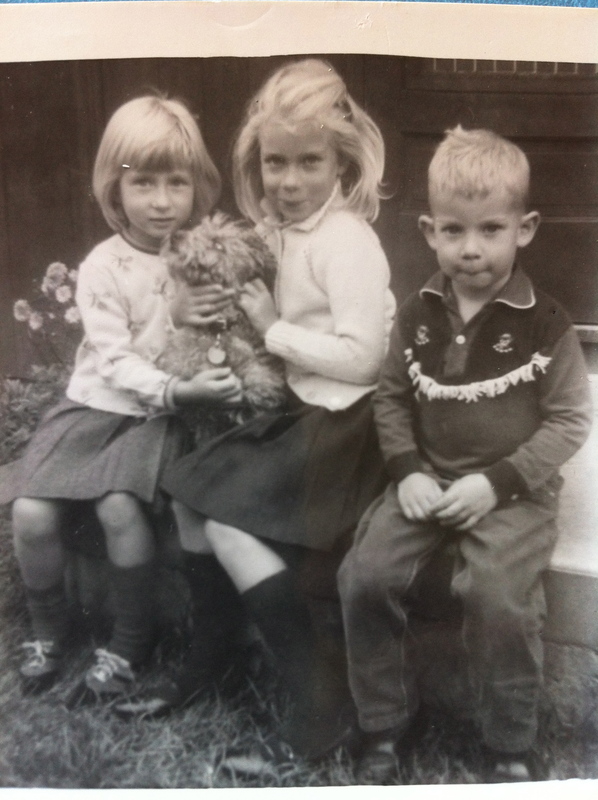 I started begging for a dog soon thereafter, and they got us Poppy, a poodle who we adored. She ran wild throughout our Madison, WI neighborhood and was, as was typical for the time – unspayed. (I will NEVER get over feeling guilt about all her many litters.) We kept one of her puppies and because poodles are black at birth, named him the only reasonable name possible – Blackie. My siblings and I with our beloved childhood dog, Poppy. Our next childhood dog was Choco. 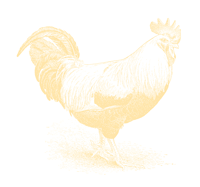 He grew up somewhat feral and free – like we did, and lived until the ripe age of 17. 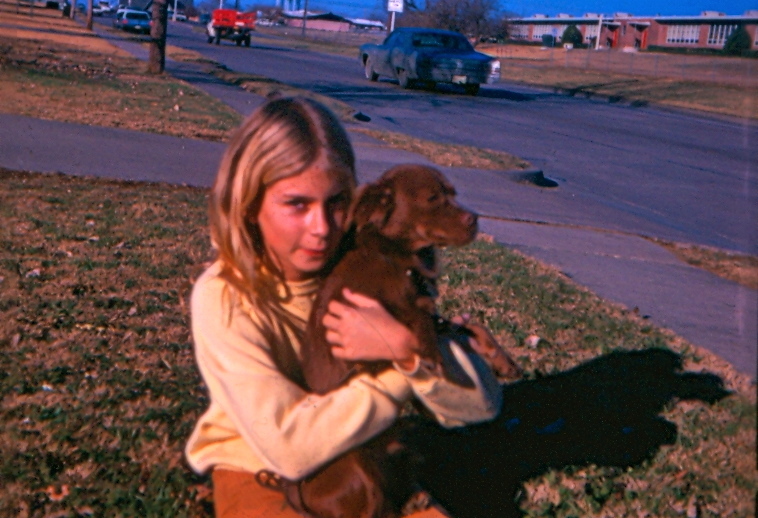 Choco and me in Richardson, Texas, where I lived in 6th grade. I got Tara in September of 1984, right after returning from a year abroad in Italy. She saw me through the most turbulent years of my life. Me and Tara, my Sheltie-mix who I adopted from the Madison Humane Society in Wisconsin. In 1995, I met Tess when she was loose and ran into my house, looking for food. I kept her and loved her from that day on. 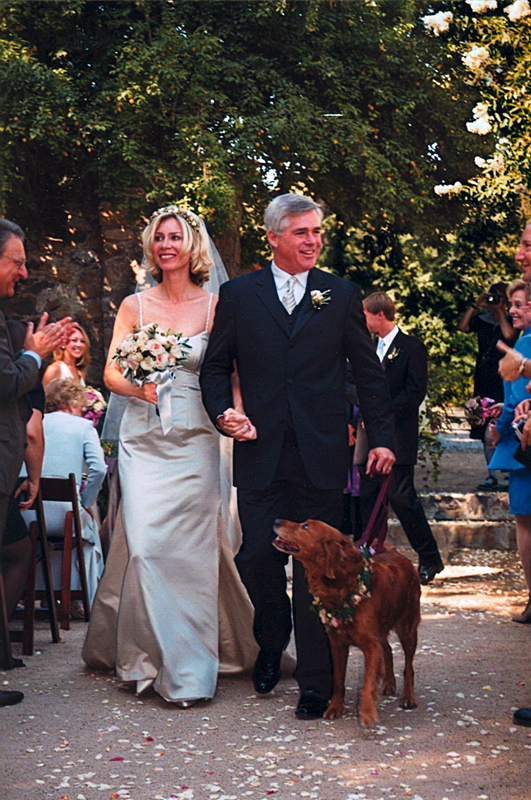 Our dog Tess escorted us down the aisle moments after we were married. I love dogs and hope to have them all the days of my life. Do you have dogs? Tell me your stories. If you like this post, please share it. Share it on Facebook, or Twitter, or Google+, or pin my photos to Pinterest or any social media platform you like. And, please take a moment to comment and share your stories! 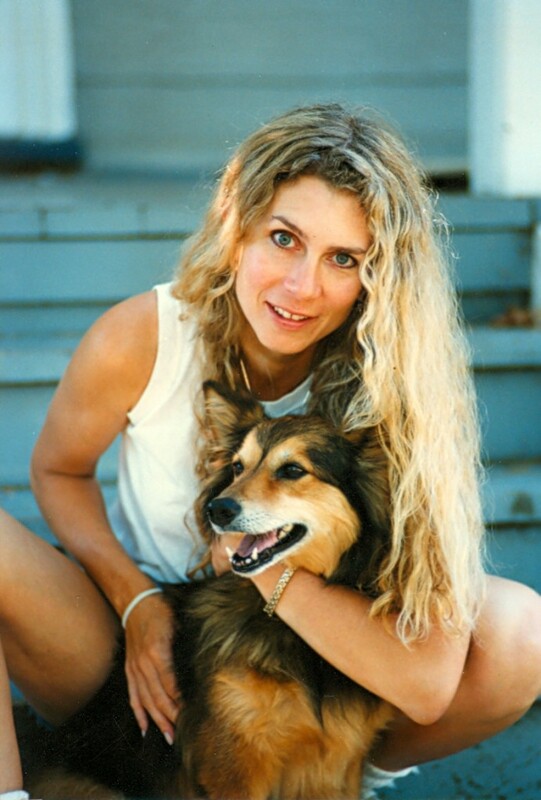 Ligeia, I love that photo of you and Tara and your expressions of love and admiration for all your dogs! I’m glad my love comes through! I want to see some photos of your pup on Treasure Seeking! Lois, I had a friend who lost her dog some time ago, and her vet said to her, “you did everything right with this little guy, how could you deprive another dog of your good stewardship.” That line sticks to me like glue. I’m sure you too will find more lucky dogs to love. Thanks for visiting!